"We found the right combine." And silence. Three middle aged Guatemalans and one gringo look at each other across a table. Each one is thinking about how important this moment could be. We could have finally cracked a problem that could double hundreds of thousands of families' incomes, help hundreds of thousands of children avoid malnutrition. And the silence breaks, "what's the soonest we can check it out?" My name is Curt Bowen, and I'm a social entrepreneur. Social entrepreneurs are just like normal entrepreneurs, except our goal is fixing big world problems. We don't measure ourselves by our market share, the price of our stock, or the time to IPO. When we're successful we won't have mansions in Silicon Valley or drive nice cars -- when we are successful we have improved the lives of thousands or millions of our fellow human beings. Social entrepreneurs care deeply about systematic problems and about scale. Volunteering at a soup kitchen is a great thing, but it doesn't make you a social entrepreneur. We instead will start thinking about how to make soup kitchens financially sustainable or fix the social problem that makes them necessary in the first place. We all know the saying about giving a man a fish vs. teaching a man to fish. Our question is, why doesn't everyone know how to fish in the first place? How can we fix that? To tell you more about social entrepreneurs let me tell you a bit about us. Guatemala has the 4th highest rate of malnutrition in the world, 79 percent of rural residents live under the poverty line, and 72 percent of the soils are severely degraded. The social impact is the second highest net illegal immigration to the US in the world, with the ensuing problems in the US and the hundreds of thousands of broken families in Guatemala. Our solution is a bean called pigeonpea. 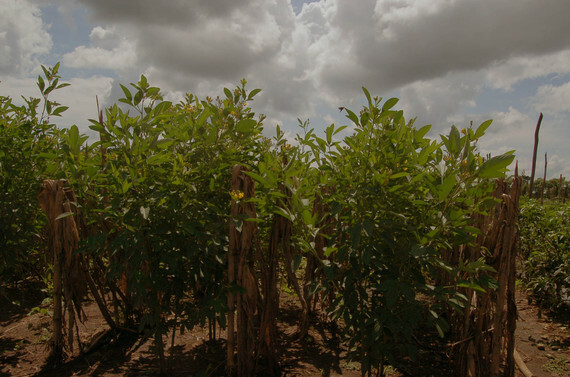 Guatemalan farmers have grown pigeonpea in their gardens for centuries. New varieties and farming techniques from India and Africa can help farmers bring pigeonpea from their garden to their whole field, increasing their yields to thousands of pounds and doubling their income. Pigeonpea also rebuilds soils and is a powerful tool against malnutrition. We worked with 30 farmers to try the varieties in 2011, with 100 in 2012, and this year we have nearly 1,000 farmers planting pigeonpea on a small scale. It has taken us years of continual work, but we have figured out the right varieties and the right growing techniques for the farmer in our region. And until last week, we had only one obstacle left. The holy grail of our work is exporting pigeonpea. Guatemala can only eat so much, and India is importing more and more to feed their rapidly growing population (pigeonpea is a main ingredient in dal). This strategy has been used in the past two decades in Eastern Africa with great success, helping lift a million families out of poverty and forming an industry worth more than 100 million dollars a year. Our challenge to replicate this success has been in harvesting. In Tanzania or Malawi pigeonpea is harvested by hand, and with our higher labor costs we can't compete. That is until we found the right machinery, until we found the right combine. With tests about to begin now in December, we might have found the one piece we needed to help our farmers profitably join the global economy, helping create an industry that could include 250,000 families. It will have taken three years to build this foundation, and it will take many more to scale. But what began as an idea by some passionate people could become a reality that changes millions of lives. This is the point I want to share. Just like an entrepreneur may spend years in financial crisis and obscurity before they make it big, social entrepreneurs need to be focused, dedicated, and work hard for a long time with little pay off. We have to be visionary and yet extremely practical. And success doesn't come from the big crazy ideas--a lot of people my age have those. Success comes from the wisdom to pick the right goal and then the tenacity to keep at it, year after year, as you try to find that combine. Curt lives in Quetzaltenango Guatemala. He founded Semilla Nueva in 2010 after years of work in Central America. He is an inaugural winner of the Ignite Good Millennium Impact Challenge, an Ashoka Emeging Innovator and a Rotarian at the Boise West club in his native Idaho.